Application services running outside the context of Avi Vantage may be incorporated into the global applications of an Avi GSLB configuration, resulting in a single point of visibility and control for global apps. Sets of third-party apps may be grouped into third-party sites to ease management tasks such as site maintenance. 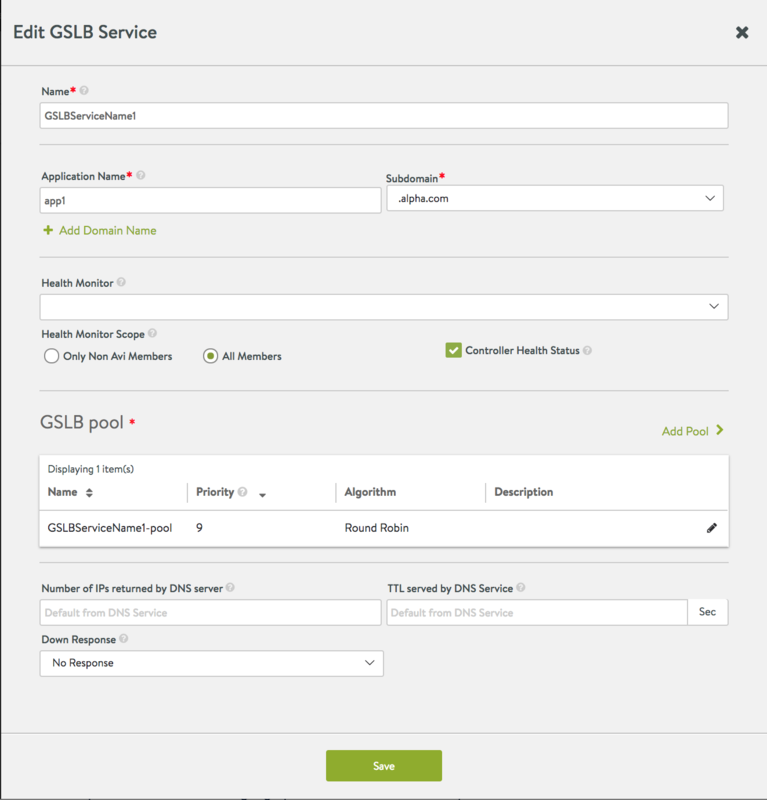 This article shows how to configure a third-party GSLB site and operate upon it. 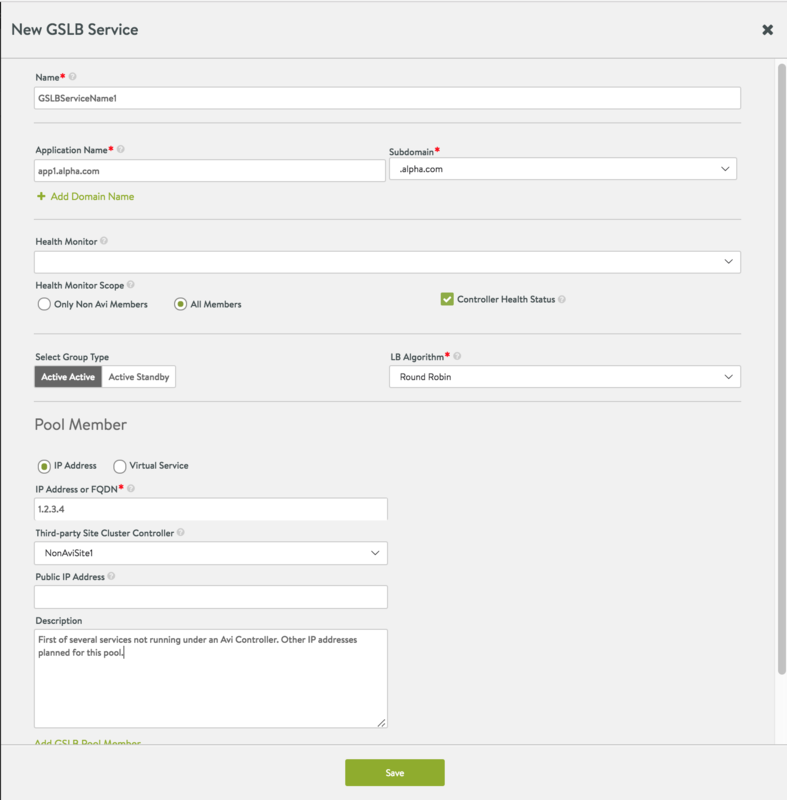 GSLB is off by default, as is evident when first an authorized administrator navigates to Infrastructure > GSLB – the only subtab visible is Site Configuration. After clicking the pencil icon, and providing a configuration name, additional tabs and buttons appear as shown below. Via the green buttons at top right, both Avi and non-Avi (third-party) sites may be defined. The editor for third-party site creation is illustrated below. After an Avi site (by default the first Avi site becomes the GSLB leader) and one third-party site is created, we see the two-site configuration shown as below. Avi sites may be active or passive, and the above Site Configuration display will show them characterized as such. However, a third-party site has no opportunity to be either active or passive; such sites are always displayed in their own separate section. Just like a native Avi member service, a third-party member service needs to be incorporated into some Avi GSLB pool. Indeed, it may be the first service to be incorporated into a GSLB pool. 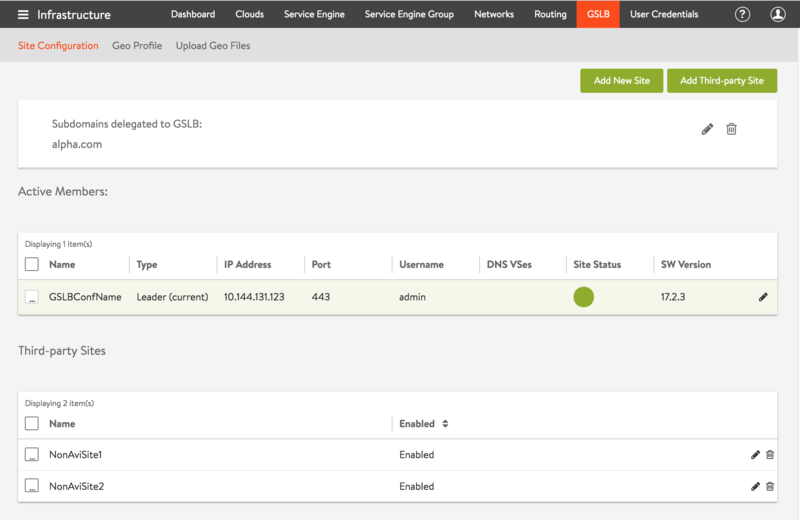 That in fact is what is illustrated in the GSLB service editor screenshot below. In general, one can identify a pool member either by IP address or as a native Avi virtual service, the latter being the default method. If identified by IP address, Avi automatically infers the member is a non-Avi service and then demands either an IP address or FQDN by which to locate it. For each third-party pool member incorporated, one may optionally furnish a pre-existing or freshly-created third-party site name (via the Third-party Site Cluster Controller field). Analogous to Avi sites, other third-party member services may be located on a given third-party site. 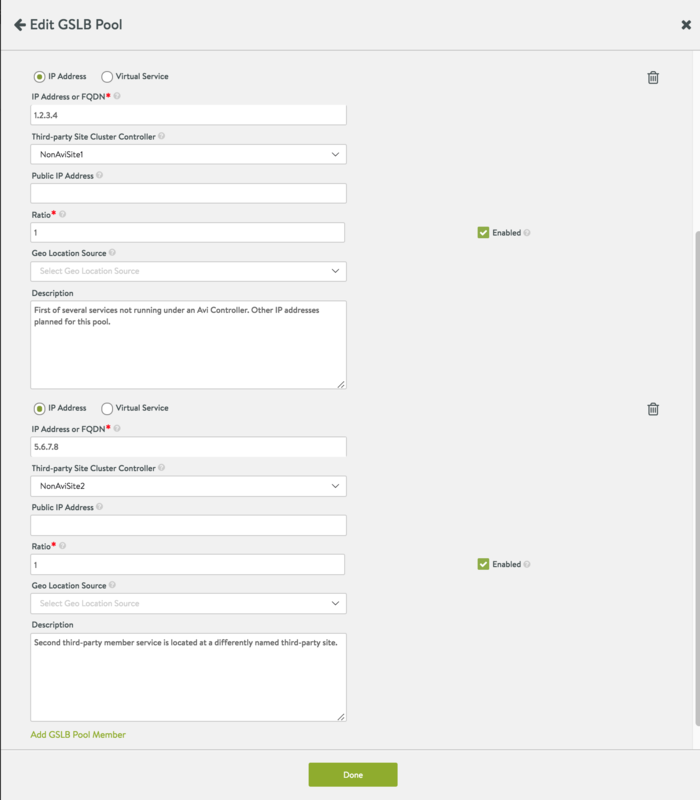 To add a second third-party site, the administrator returns to the Site Configuration screen, clicks on the green Add Third-party Site button and furnishes information as before. The final result might look as depicted below. Click the pencil icon associated with the GSLB service to be expanded to bring up the below screen. Click on the pencil icon for the GSLBServiceName1-pool to bring up the GSLB pool editor. Scroll to the bottom of the editor and click the Add GSLB Pool Member hypertext. The editor window will expand. Scroll down and complete the details for the second pool member, which will be associated to the freshly created third-party site named NonAviSite2. Click on Done to complete edits. 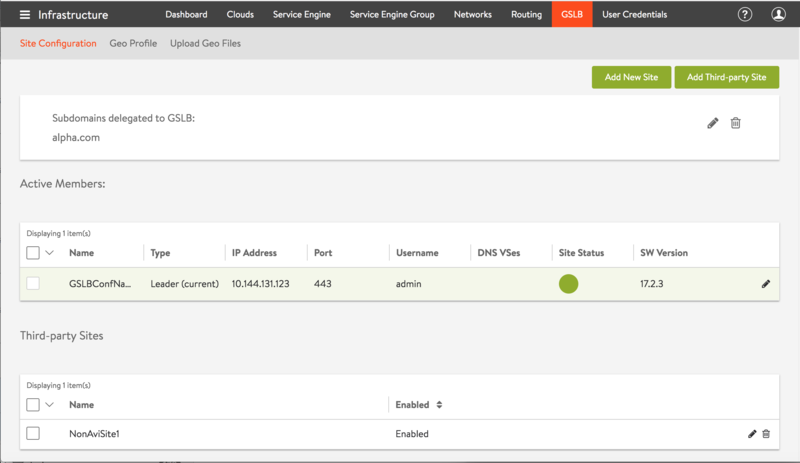 Now the third-party GSLB service named GSLBServiceName1 has a “footprint” on two sites. 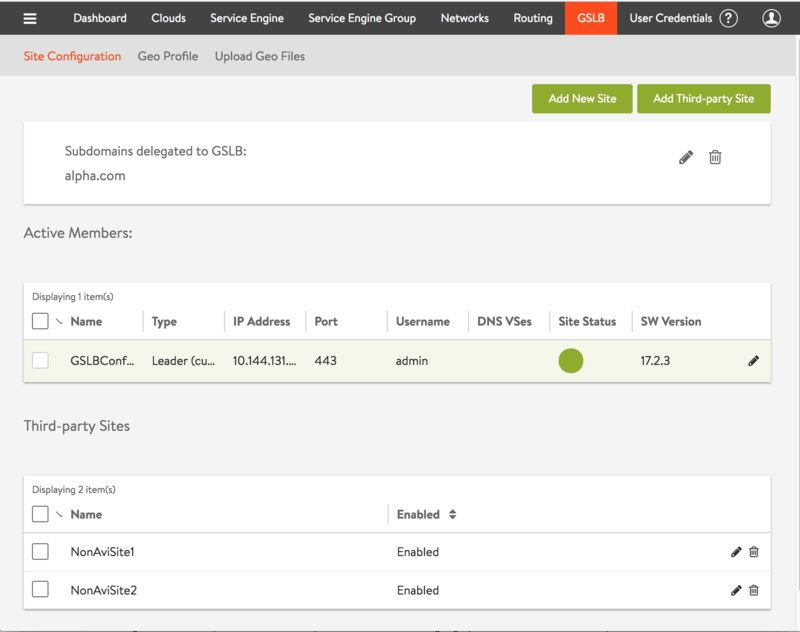 Aggregating external services into third-party sites allows the administrator to disable all members of a site, rather than having to explicit modifying the members of many GSLB services. For example, when performing hardware or software maintenance at a single site, one can disable a set of resident member services in just one step. For example, start with the two-site configuration shown below. To disable every third-party member service running at NonAviSite1, simply click on the pencil icon at the right end on that site’s row. On the screen that subsequently appears, uncheck the Enabled option and click on Save. 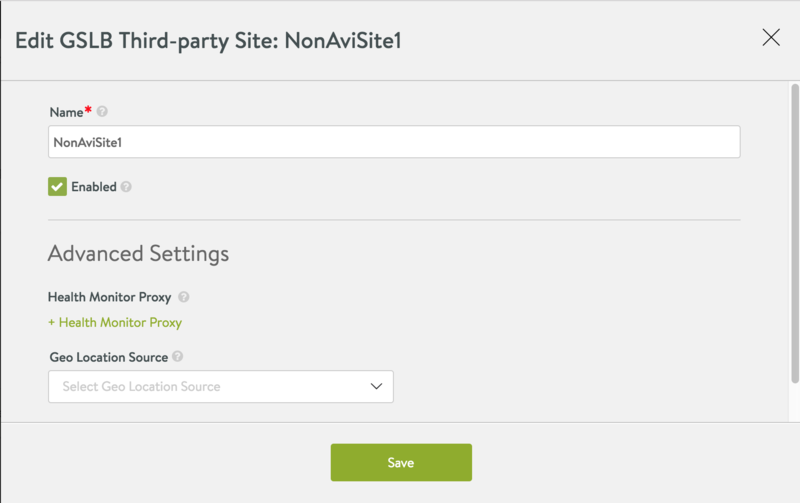 The Third-party Sites section of the Site Configuration screen will confirm the change, as shown below. Only data-path health monitoring can be applied to third party members. Gathering GSLB pool external members into a third-party site enables easy optimization of health monitoring. First, identify an active Avi site from which health monitoring would be most efficient (proximity to the third-party site and other factors will influence the choice). Then use the GSLB Third-Party Site editor to select the chosen Avi site from the Health Monitor Proxy pulldown menu. For more information on health monitoring by proxy, read this section of the Avi GSLB Service Health Monitors article.